Our guest blog post this month is from author Michael Houlihan who has recently published an excellent work on the Holy Wells of County Clare which includes 60 colour plates, maps and invaluable information. Michael completed an MA in Arts (Local History) in 2015, having previously done courses in Archaeology and Regional Studies. He has published two books, “Puck Fair, History and Traditions” (1999) and “The Holy Wells of County Clare” (2015). He is currently working on a book entitled “The Sacred Trees of County Clare” of which this article is a very welcome introduction. A review of his book is coming soon. When considering writing a piece on Clare holy wells recently, I thought that instead of focussing on the springs I might instead take a look at sacred trees, which form such an intimate part of the holy well space. I am no expert, but it seems to me that these trees seldom get the attention they deserve and are now only recognized as an additional artefact, there to complement the blessed well. Before starting, for those of you who may not know Clare, it is one of the 32 Irish counties, lying in the lower half of the west coast, hemmed in by the Atlantic, the river Shannon to the east and south, and ferocious Galway men (at least when playing the game of hurling) to the north. Debate on the age of Irish holy wells ebbs and flows. Currently it’s thought that many wells (not all) came into use in the early medieval period. They were in active use for several centuries, faded a bit and were re-invigorated around the late 16th century (possibly prompted in part by Counter Reformation activities?) Sacred trees are generally grouped with the wells, lending both status and sanctity to the holy well site. There is little doubt that during the enormous deforestation that took place in Ireland in the 16th and 17th centuries it was a significant advantage to trees to stand within the termonn or protected area of the well. This location also shielded them during searches for kindling or charcoal material in later years, as no sacred wood could be burned. ‘The Unusual Tree,’ an old and beautiful ash at Saint Flannan’s holy well, Drumanure. There is a growing school of thought pushing scholars towards the notion that a very early deep reverence for trees might indeed have been a significant Irish phenomenon. These trees may have been a source of veneration in themselves and part of a belief system at least as old as the sacred spring. There are clues to this in the literature (cf. Dindsheanchais) but perhaps one of the best indicators of an ancient tree custom is the word bile, pronounced ‘bill-a’, meaning ‘sacred tree.’ Anglicised to bella, billa, billy, villa, vella and many other variants, it occurs in hundreds of place-names across the country. A short exercise identified eight bile place-names in county Clare alone. A deeper look would certainly lead to more. There is no doubting the very early and constant presence of sacred trees in the story of Ireland. Without visiting the history too closely, the earliest written records – transcriptions taken from a long oral tradition – speak of the five sacred trees of Ireland, reaching back to the mythic era. At the beginning of the Christian age a little after 400 AD as writing began to come into use, trees were important to both secular and religious. No king had a cathair or estate without his sacred tree (bile ratha), no inauguration or assembly site was without one or more trees, churches and saints were all the stronger for the presence of trees. The tree as source or symbol was associated with power. When this age passed, trees maintained their presence at holy wells and abandoned monasteries or were left standing apart in open plains. Many trees stood for centuries. Gnarled and heavy, they finally keeled over in exceptional old age. Even then, lying spent, they were honoured with votive rags or coins hammered into their trunks. Holy Wells and Sacred Trees: It is generally understood that a tree or bush beside a holy well partakes of the sanctity of the well. Many folktales combine the origins of the holy well and sacred tree. In others the tree came later, or perhaps more correctly, the story explaining the presence of the tree came later. 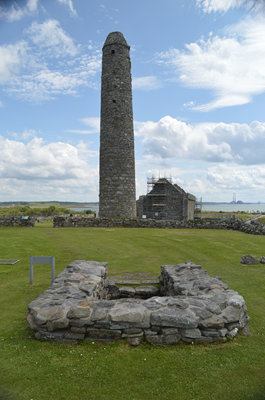 One such tale describes a severe drought on Scattery Island in the Shannon estuary, forcing the sixth century Saint Senan to dig a pit with a hazel stick. When finished he stuck the rod in the ground beside the hole. The following morning crystal clear waters flowed from the hollow and the stick had grown to a full sized tree. 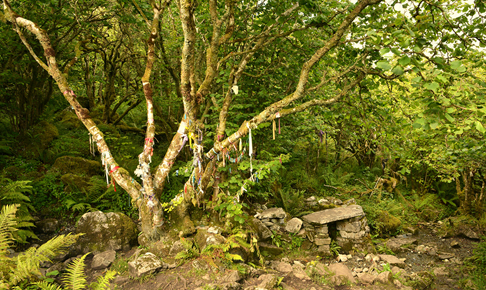 Bile cuill (the sacred hazel) is said to have stood beside the well for generations. Saint Senan’s well on Inis Cathaigh /Scattery Island. When Saint Finghín’s well was deliberately filled in, water was seen dripping from a nearby tree. Tobercrine (tobar i gcrainn – the tree well) can still be pointed out beside the ruined abbey today. A tree that grew from a stick blessed and planted by St. Feicín at Loughcooter (now Loughcutra) was much venerated (3). St. Muaghan’s tree stood as an emblem of sanctity at Kilmoon holy well in the north of the county until old age caused it to topple in the nineteenth century… and so the stories continue. Trees are not only cherished companions of the well but also serve as markers around which people move when performing the prescribed ‘rounds’ or ‘stations’ – walking meditations if you will. When prayers are completed, rags are tied to the tree or bush as an offering of thanks and a means of leaving concerns in the care of the saint. 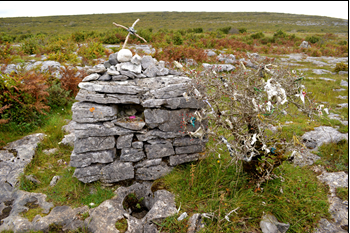 One remote Clare well, dedicated to St. Colman Mac Duagh, has extensive offerings on its rag tree. 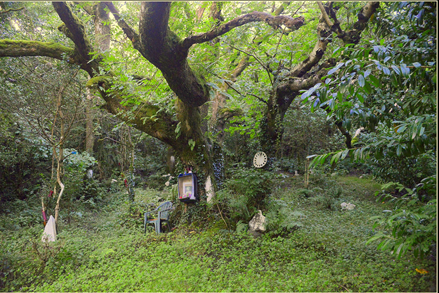 It lies hidden in a grove of hazels for much of the year and contains many of the elements of an early Irish eremitical site – holy well, rag tree, hermit’s cave, 7th century oratory and two leachta (altars), as well as having a significant corpus of stories about its past. There is one reference from the early 1900’s which might suggest remnants of tree veneration near a holy well, which reads ‘The devotees take off their shoes, stockings, and hats, (or, if women, their shawls and bonnets), and start for the well repeating the prescribed prayers. They climb to kiss a cross on the branch of one of the weird old weather-bent trees in the hollow, and, lastly, pour water from the well on their faces, hands, and feet.’ 4 The addition of a crucifix to the tree here may have Christianized an older practice. However the tree may also have been nothing more than a ‘station’ in the prescribed ‘rounds’ of the well. The types of trees found at holy well sites vary enormously. The ash seems to have been by far the most important tree in ancient Ireland (not the oak as one might think, even as a leftover of things Celtic – blame Pliny.) A study of 210 holy wells in Cork in the 1960’s found a prevalence of thorns or whitethorns (103), ash (75) and oak (7), with a mixture of other trees making up the remaining 25.5 The blackthorn – small, wizened and nearly indestructible – has always been a favourite as a rag bush, especially on poor land. St. Fachtnan’s well with its blackthorn rag tree, Termon, Carran. A great love of the natural world permeated early Irish Christianity. One has only to read some first millennium nature poems by the saints to see this. Here is a small flavour from a longer piece entitled Atá Uarboth Dam I Caill, translated here as ‘The Hermit.’ The 9th century poem is attributed to Saint Marbáin, in which he describes nature’s bounty at his little hermitage. and a great fern makes the door. St. Colman Mac Duagh’s well, Keelhilla. As well as the cherished trees at holy wells there are several other tree types held in affection across the Clare countryside. These include inauguration and assembly trees, religious trees directly associated with a church, monastery or graveyard, trees found within liosanna or ‘fairy forts’, funerary trees at which a funeral might pause, Mass trees and lone bushes. It is with lone bushes we will complete our story. Lone Bushes: Lone bushes tend to be in a category separate to the trees we have been discussing, coming from a long-held indigenous belief system that has only recently faded. They are mostly stand-alone whitethorns that grow at a distance from other trees. In Irish the whitethorn is called Sceach gheal meaning bright or shining (thorn) tree, because of its profusion of splendid white flowers in early summer. The single whitethorn is strongly associated with fairy folk who, as people will know, are at the best of times a bit temperamental. Consequently lone bushes are never interfered with; the month of May being the only time some latitude is given. Being supernatural trees they serve as important foci for the Lucht Sidhe (the fairies), particularly before important events. Here our Clare story lies. In the late 1980’s the main motorway going north from Limerick city (M18) was being significantly upgraded. To facilitate road expansion a fairy tree at Latoon, Newmarket-on-Fergus would need to be destroyed. 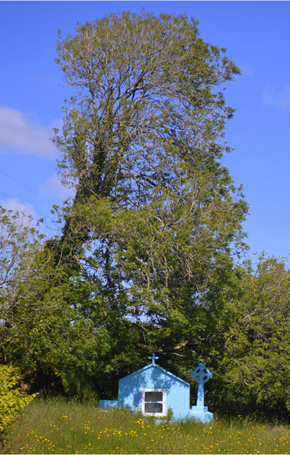 Local folklorist Eddie Lenihan objected saying that this tree marked territories between two groups of Sidhe (Shee) and was an important assembly point before and after fairy battles. Its removal would not alone be an outrage to folklore and tradition – much worse – should the wrath of the Sidhe descend, it could have serious repercussions for traffic users passing the spot in the future. Whichever aspects of Eddie’s argument were most cogent, he won his case. The route of the motorway was altered and the tree still stands. Lone fairy bush at Latoon, foreground. A last word on an important aspect of holy wells and trees not yet mentioned is the modern pilgrim. 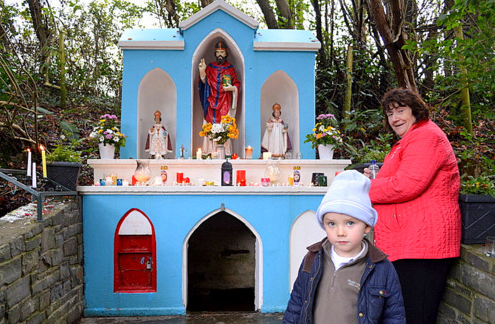 A cohort of people across county Clare, mostly made up of the very young and the no longer young maintain the wonderful tradition of holy well visitation, including interacting with the bile, especially on the saint’s patron day. For them the well is a living entity, to be honoured and enjoyed. It’s a day of rosary beads and prayer, flasks of tea and sandwiches, small courtesies and chats with fellow pilgrims, with plastic bottles of blessed water being filled for friends at home. Later they will return to help maintain the holy well site or perhaps cajole their sons to fix a damaged wall or fallen stone. Whether they know it or not, and I think they do, they are the last remains of a vast tradition. 1 Irish Folklore Collection, Ms. 466, p. 398. 2 Daniel Mescal, The Story of Inis Cathaigh, (Dublin 1902), p. 65. 3 Irish Folklore Collection, Journal 12, p. 73. 4. TJ Westropp, recorded on a visit to what is now St. Joseph’s Well, Kilmurry Ibrickane, in Limerick Field Club Journal. Vol III No 9 1905 p 15. 5 A.T Lucas, ‘The sacred trees of Ireland’ in the Journal of the Cork Historical and Archaeological Society, (JCHAS), lxviii, (Cork, 1963), pp 16-54. 6 The Tripartite Life of Patrick, 9th Century, CELT, (UCC, Cork) p. 185. 8 James Carney, Medieval Irish Lyrics, The Dolmen Press, (Dublin 1967), pp 67-72. County Clare contains one of the greatest concentrations of holy wells in Ireland. While most wells are associated with local saints, some have earlier origins and different affiliations. In this book, Michael Houlihan tours these wells, examining their long history from earliest times and reviewing their unique traditions. The defining characteristics of native wells and their distinctive physical features are explored along the way.Holy Wells have been of service to generations of Irish people. In spite of repeated waves of invasion and suppression, followed by political and religious strife, over 3,000 wells still exist in Ireland today. They once proved a centre for religious expression when no other existed, offered shelter in Penal times and served as a focus for communal solidarity. In Clare, participation was strongest in the decades before the famine, when venerated springs made a huge contribution to local communities. They performed a key role in village healthcare systems and erased the pain of bereavement, especially involving infants. Te continuing loss of the Irish language and the slow attrition of long-held folk beliefs, also at this time, deeply impacted daily life, including holy well usage. The great holy well patterns of the late 18th century, once the high point in the rural social calendar, are discussed, including those in Clare on Scattery Island and Inis Cealtra and at Killone. When the Catholic Church began reasserting itself, aided in part by Daniel O’Connelll’s in the 1828 Ennis by-election, the Patron Day gatherings and other aspects of folk life were slowly surrendered, as the last vestiges of the old Gaelic world slipped away. The Famine compounded these changes, with congregations forfeiting the fields and wells for the new chapels. The holy wells story continues into the presentm including its occasional high points in the twentieth century. Ten contemporary Clare wells are visited, from the popular St. Brigid’s at Ballysteen to others since fallen out of favour. A final section discusses the health of the holy well tradiiton in the county today. The book contains nearly 60 colour photographs from across the county, with some basic maps and tables for those interested in doing their own exploration. While Clare’s holy wells have long been associated with peace and health, they are also an archaeological and historical treasure trove waiting to be rediscovered. This book will help those who want to better understande a neglected feature of the landscape while catching up on a lost part of Clare’s social history.